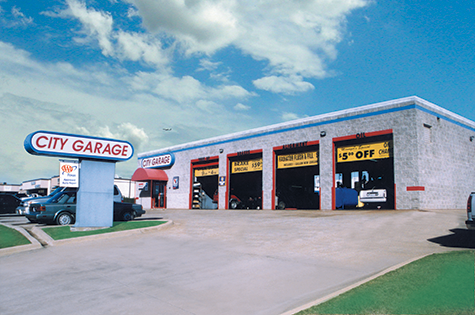 For New Tires, Tire Service or Tire Repair in Dallas and Fort Worth, visit any DFW City Garage. City Garage carries a complete line of brand name new tires including Bridgestone, Firestone, Goodyear, Toyo, Yokohama, Pirelli, BF Goodrich, Dunlop and more at multiple locations in Dallas and Fort Worth. City Garage offers: Free flats fixed for the life of the tires and FREE 4-tire rotation every 12 months for the life of your tires. We also offer a premium $25 OFF tires coupon for a new set of tires, cheap tires or tire service, which you can use on a new set of Michelin, Bridgestone, Firestone, Goodyear, Toyo, Yokohama, Pirelli, BF Goodrich, Dunlop and all major new tire brands. Click here for our $25 OFF tires coupon. 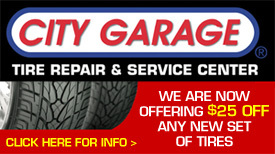 Compare City Garage’s tire repair service and our $25 OFF tires coupon to the major tire retailers in Dallas Fort Worth like Discount Tires and you will see that City Garage beats them step for step on price and services. Plus, City Garage can do a computerized wheel alignment tire service at any Dallas Fort Worth location, which every vehicle should get when new tires are installed. No matter if you need cheap tires, a tire repair coupon, discount tires, replacement tires or new tires in Dallas Fort Worth, we have a large selection of tires for you to choose from. New Tires, Cheap Tires Coupon, Tire Repair Dallas and Tire Service Fort Worth. 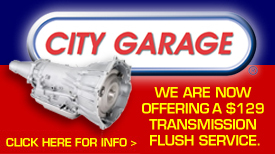 Call (972) 283-CITY today for a quote on a new set of tires.